If you aren't sure what size fan or shutters you need, use our Fan & Shutter CFM Calculator. - Rustproof aluminum shutter frame with built-in interlocking louvers to reduce heat loss in the greenhouse during cold months. - Fan motors come setup to be hard-wired and can converted to plug-in with the included 9' power cord. - Fans can be automated with any of our 110/120 volt greenhouse thermostats. - Fans come equipped with completely enclosed variable speed direct drive motors which can be adjusted from 100% to ~35% of CFM if one of our optional fan speed controls is added. This allows you to reduce fan speed during cold months minimizing cold air shock to plants. Fans only run at maximum speed without a speed control. - Fan motors come prewired with a grounded 9' power cord. - Fans come with plug but can be hard wired as well. - Fans come equipped with completely enclosed multi-speed direct drive motors which can be manually adjusted with the built-in 3 speed switch (2 speed for 24" fan) and 2' extendable pull-chain. This allows you to reduce fan speed during cold months minimizing cold air shock to plants. - Fans can be automated with any of our 110/120 volt greenhouse plug-in thermostats. - Fans are plug-in only and are not setup to be hard wired. - Included louvers are painted white and are lined with weather stripping to provide quiet operation and reduce heat loss in the greenhouse during cold months. - Shutters can be equipped with an optional shutter motor to automate them and prevent wind from opening the louvers when ventilation is not necessary. - Motors mount directly to shutter for easy installation. - Lowest power usage in the industry of only 2 watts. - Very quiet. No loud humming commonly found with other shutter motor brands. - Shutter motors can be used with any of our 110/120 volt greenhouse thermostats and come setup to be hard wired or prewired with an 3' power cord and plug. ALL fan systems include a SureSTAT TS110 thermostat and fan speed control. Fan systems above are designed to be hard wired and include wiring instructions. These complete wiring kits are designed for wiring our variable speed fan systems in greenhouses or other wet areas. Kits use all rustproof materials which meet or exceed building code requirements for wet locations when properly installed, and the flexible conduit makes installation quick and easy. Wiring kit can be wired directly into an existing electrical line or wired to a power supply cord (included with our fan system packages) and plugged into an outlet. Fan wiring kits include: flexible conduit, flex & T connectors, aluminum conduit clamps, 14 gauge wire & wiring nuts, and installation instructions. Additional accessories for these wiring kits are available in our Greenhouse Electrical section. 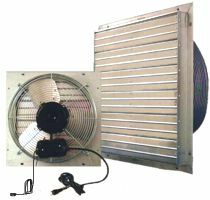 The 25' wiring kit is designed for small greenhouses using a single intake shutter fan system. The 50' and 100' kits will work with single or two shutter fan systems and larger greenhouses. The Greenhouse Size column below are only recommendations. If you are not sure which length you need, view our Wiring Kit Sizing Diagram for additional help. Provides fresh air for plants, helps control humidity, & boosts ventilation of roof vent systems! 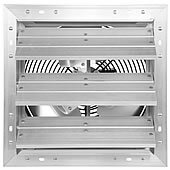 These intake fan systems are great for supplying fresh air to plants in the winter when it is too cold for traditional ventilation systems to run. Just set it on a timer to run a couple times daily for a few minutes. Bringing in fresh air also helps keep humidity from getting too high in the winter. The larger 8' intake fan is best for boosting the ventilation / cooling provided by greenhouses with roof vent systems by bringing in cooler outside air near the plants and pushing hot air out of the vents. Both systems come with screens and a built-in damper to keep out cold air when they are not running. Requires a standard 110/120 volt outlet. OPTIONS: The adjustable elbow connector allows you to direct the flow of air up to 90 degrees, and the wye connector splits the air flow into 2 different directions. An extra screened cap is also included with the wye connector. A screened exhaust vent with damper is available as well to provide an air outlet for tightly sealed greenhouses. Intake fans can be automated with a timer for fresh air delivery, dehumidistat for humidity control, or a thermostat for temperature control.